Chef and Restaurateur David Burke has a new baby, namely his restaurant, David Burke Fromagerie, in Rumson, New Jersey, which opened in May 2006. I have long been a fan of Chef David Burke and his creative approach to cuisine, so when I heard about his new restaurant, David Burke Fromagerie, I knew that I had to have dinner there. 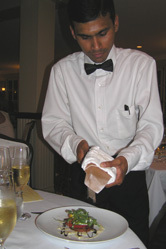 The restaurant has an interesting history; David worked at Fromagerie when he was a teenager. At that time, the restaurant was a legendary French restaurant, and when the restaurant's owners wanted to sell the restaurant after 35 years, David knew that he had to purchase it. 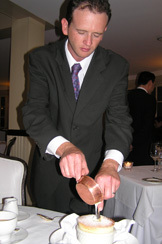 On a rainy September evening in 2006, Edward F. Nesta and I drove from Connecticut to have dinner at the restaurant. The traffic to the restaurant was impossible; it had all the elements of horrendous driving, it was a Friday, it was rush hour, there were long delays, periods of rain so heavy that we could not see the end of the car, plus the usual fender benders that are associated with such nights. By the time we arrived at the restaurant, we were stressed and exhausted from the ride, but when we entered the restaurant, we were more than pleased we had made the trip. David Burke has a keen sense of humor and enjoys whimsy, which is apparent in the paintings, the sculptures, and objets d'arte in his restaurants. As we entered David Burke Fromagerie, a child-size sculpture of a young boy wearing adult boxing gloves and oversized shoes greeted us, which seemed appropriately fitting after battling traffic to the restaurant. Lindsey, the gracious hostess, guided us to our table and our stress melted away. The pretty dining room has mushroom colored walls, wainscoting with black trim, and beige, black and caramel geometric design carpeting. There are sconces and interesting paintings on the walls, wooden ceiling fans, and creative floral and fruit arrangements throughout the restaurant. The tables are formally dressed with white tablecloths and white napkins, Villeroy & Boch china, and white votive candles in low cut glass bowls. We began our evening with an aperitif of Louis Roederer Brut "Premiere" champagne, a blend of 56% Pinot Noir, 34% Chardonnay, and 10% Pinot Meunier, as we looked over the creative menu. David has kept many of the traditions of the former Fromagerie, but has put his own culinary spin on the menu. 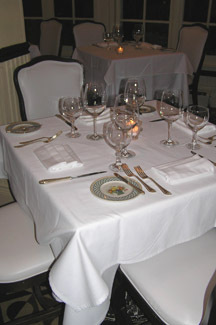 In addition to the regular menu, the restaurant also has a four-course Tasting Menu, which we decided to experience. The Tasting Menu began with a delicate Sun-dried Tomato Flan amuse with a decadent layer of black olive tapendade with a hint of lemon and basil. 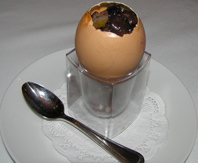 The flan, served in a brown eggshell, rested in a specially designed square eggcup with peppercorns in the well of the cup, was visually appealing, and deliciously soothing on the palate. For our first course, we had the Heirloom Tomato Salad, which was three layers of multi-colored heirloom tomatoes, a slice of ripe Jersey peach, wild arugula, drizzled with vinaigrette with a scattering of thinly shaved Manchego cheese, and was accompanied by a gigantic cheddar cheese and poppy seed popover, still warm from the oven served in a miniature copper pan. A 2003 Chappellet Dry Chenin Blanc, from Napa Valley, with tropical fruit notes complemented the salad. Tomatoes sing with a bit of salt, and they sang loud and clear, after Salim grated pink Himalayan salt on them. 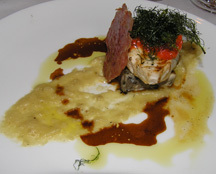 We continued with Grilled Swordfish with Fennel Brandade and Pepperdew Confit for our second course. The swordfish was presented as two stacked squares of perfectly seasoned and cooked swordfish, topped with a sweet and spicy pepperdew confit, crowned with flash fried fennel leaves, garnished with a thin slice of crispy chorizo, with fennel brandade served around the swordfish. The pepperdew, (a small, sweet and piquant pepper from South Africa), acted as a perfect counterpoint to the swordfish and the fennel, and was beautifully paired with a 2005 Bourgogne Blanc Les Sétilles, Olivier Leflaive, made with Chardonnay grapes, with citrus, peaches and mineral notes. For our third course, Edward and I decided to part ways, he selected the Surf and Turf, which was a Filet of Beef and Shrimp, with shallot potato cake and red wine natural. The presentation began with a potato cake, followed by a layer of thin asparagus, a knife-in-butter tender filet, adorned with a colossal sized shrimp, and served with a drizzle of red wine sauce. I selected the Pan Seared Halibut with Lobster Dumplings and Lobster Bordelaise, and fell in love with this dish, which our waiter, Nahum Samuel said is the most popular dish on the menu. 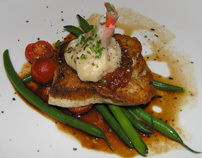 The halibut filet was served on a bed of lobster bordelaise, halved cherry tomatoes, and haricot verts with a lobster dumpling as the finishing touch. The Surf and Turf and the Pan Seared Halibut were paired with a 1996 Château Lynch-Moussas, Grand Cru Classe Pauillac, with a wet earth, tobacco, and leather nose, with excellent structure and balance, and rich black cherries on the palate. For our dessert course, Edward selected the Chocolate & Caramel Layers with sel gris, espresso reduction, cocoa nib tuille, and cocoa nib ice cream. This was pure chocolate decadence in the form of thin layers of dark chocolate and caramel, and the sprinkling of salt on the top layer of the chocolate was magic. I selected the Grand Marnier soufflé, and was glad that I did. The soufflé was heaven; puffy, light, and airy, with the perfect balance of Grand Marnier, and enhanced with a crème anglais sauce, which Nahum poured into the center of the soufflé. Just as we finished the Chocolate & Caramel Layers and the Grand Marnier Soufflé, Nahum returned bearing David's famous Gourmet Cheesecake Lollipop tree with raspberries. 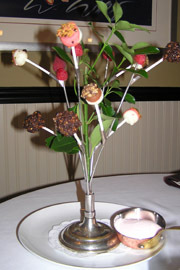 David loves to add whimsical touches to his presentations, and he created a silver "tree" where the branches are made of cheesecake "lollipops" and is accompanied with raspberry bubblegum whipped cream. After dinner, we took a tour of the restaurant with Manager, James Cuomo, to see the upstairs dining room which David calls the "Toys in the Attic" room, where a few of his toys include a child-size version of a Bugatti racecar and a Raggedy Ann doll. We also toured the wine cellar where guests can have an intimate dining experience. We even toured the kitchen and met Kevin Haeger, the talented Chef de Cuisine. The drive to the restaurant was definitely worth it. Read other articles on David Burke in the Chefs' Recipes and Luxury Products sections, and an article on his restaurant, davidburke & donatella in Restaurants - davidburke&donatella.